The schools bells are ringing and that means it’s time for the kiddos to go back to school. Send your children back to school in style with a healthy lunch box that is sure to make their tummy smile . By following the Myplate guidelines, which include packing fruits, veggies, and grains, lunchtime can be healthy and equally yummy! As you prepare to pack your child’s lunch, take a look at these recipes for #healthy #foodspiration! Drinking water is so important for kid’s health and should be a part of their daily schedule. Drinking water daily provides hydration, helps control calories, energizes muscles, and keeps skin looking good! 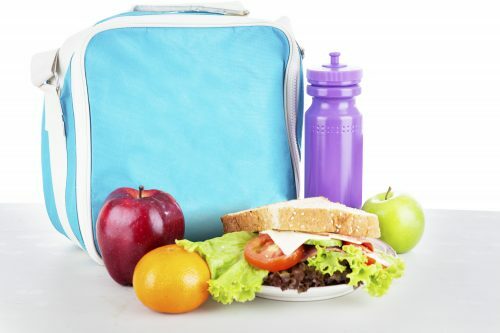 When packing your child’s school lunch, skip sugary drinks and instead include bottles of water. One way to make water fun and tasty is to add in fruits and veggies to create different flavors. Try adding strawberries and blueberries for a flavor explosion. For more ideas on adding flavor to your kid’s water, please click here. Sandwiches can be a little boring at times, but sandwich wraps give you an opportunity to add loads of healthy veggies inside of a whole wheat tortilla wrap for your kiddos. A few kid approved favorites include, adding diced chicken, lettuce, and avocados. The options for this lunch staple are nearly endless. Another great thing about this meal, is that you can make these ahead of time and store them in the fridge for future use. Can you say time saver! For more sandwich wrap ideas, please click here. Pretzels and hummus dip makes for the perfect mid-day snack or side dish to any lunch meal. The great thing about hummus is that it’s extremely flavorful thanks to the Garbanzo beans and it can be spiced up to your child’s liking. Plus, crunchy pretzels can make any dish taste better! Try picking up a yummy hummus dip the next time you’re at the market, or if you have the time, try making this homemade hummus for your little ones. Dessert can be healthy too! These apple, peanut butter, and raisin sandwiches are a great way to add a little sweet to your child’s lunchbox, but also keep it healthy. For this recipe, slice and core apples of your choice, spread peanut butter on top, sprinkle raisins to your liking, and top your sandwich with another apple slice. If you happen to have granola on hand, you can also sprinkle it on top for an added crunch.